Yesterday gave us some helpful guidelines to follow when it comes to preparing your child for toilet training, and also helping you to gauge if your child is ready to be trained. Now, for today. Recognize, that no matter what the age, but especially if you are struggling to train an older child, it is usually not about their ability to be trained, it is about CONTROL. We can control or force everything upon a child, but, Going to the bathroom is the one thing that children have ultimate control over. Ultimate Control. They decided where and when they will go, and there is little, if anything that we can do about it. Some children will hold on to this for as long as they can. The child feels like they don't have control over their lives so they try to gain control by hanging on to the one thing they are ultimately in charge of. Their bowels. It gives them control over something, and they know that, and it gives them attention and power. Refusing to train is an outward expression of those inward feelings. So how can we get kids to give up this control so that they can be trained? I offer two suggestions. Give the child control in other areas. The goal is to have them feel in control of their lives. Give them two choices of what to wear in the morning, let them choose. Let them choose what they want for lunch. Let them choose their vegetables. Let them choose what park you will play at, or the routine they would like to follow for bedtime. Let them choose the jobs they will do around the house or where they want to sit in the car. Give them opportunities to lead and to be in charge. As they begin to feel control over other aspects of their environment they will relinquish control of their bowls. Give your child more one-on-one attention. To a child who is seeking attention, it doesn't matter if the attention comes from positive or negative actions, it is still attention. When a child does something wrong, even if you scold them, you have had to "deal" with them, you have paid attention to them. Set aside extra time to be with your child. Time everyday to play, with no restictions, or interuptions. Let your child choose what they want to do. Pretty soon the extra positive attention will help them let go of the need to gain attention by being unwilling to train, or by going in their pants. They wont need you to change their diaper to get attention because they will be getting plenty of attention in other ways. Refer back to what we talked about yesterday with a stubborn child. If you have a child that is stubborn, use yesterday's techniques to deal with them before you try and train them. Next, as a parent, when you decide to train, stick with it. In many cases the parents were not committed to training the child and that is why it was unsuccessful. It sends mixed messages to your children if you are willing to go back and forth from diapers to underwear to diapers to underwear. Why are children going to put forth effort when they know their parents will just give in and let them go back to diapers? Parents need to be ready for toilet training also. Don't dabble in it. Wait until you and your child are ready to do what it takes and then go for it, don't look back. Stay the course. When a child becomes toilet trained it gives him/her great confidence and a feeling of mastery. These feelings will generalize into other aspects of their lives. They will have more confidence and desire to do things on their own, like feeding themselves and dressing themselves. This new confidence will buoy them up and push them to face new challenges and tasks. 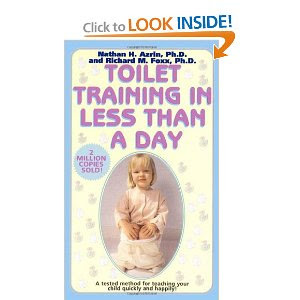 Whether you are just starting to think about training a child, or you have a 5 year old who is long over due for "big boy pants", the best technique for toilet training is "Toilet Training in Less Than a Day" by Nathan Azrin and Richard Foxx. You can find the book online or at your local book store. Not only does the method work, but your child is trained in a day, and oh how the stress is alleviated. It will be a pleasant experience for everyone involved. Much of what we have talked about in yesterday and today's posts comes from basic learning strategies that can be found in "Training in a Day", as well as most psychology books. These learning theories really work, and not just with toilet training. They are vital to raising children, regardless of the challenge. A word of advice. This method is successful, but it takes parental commitment. You must be willing to get the book and read it, know it, and then be prepared. You will need to committ a day to training. To staying home and teaching the method. When you are done, not only will you have a child who has dry pants and goes in the toilet, but they will be able to do it themselves, and they will be happy. It is wonderful. And remember, if you have an older child that you have tried to train without success, consider having someone else use this method and train them. Their father, or a close friend, even a responsible teenage sibling. Don't deviate from the process and you will see amazing results. Disclaimer: Just because a child has been trained, doesn't mean they are perfect. Accidents can still happen. I have helped countless numbers of families use the method with 100% success. I have used it on two of our three children, and in the next few months will use it on our third child. I train them in the morning and by the afternoon, we are out running errands without diapers. What ages do you usually train your children? Any success stories with this method? P.S. I uploaded a picture of our son sitting on the toilet when he was little, but couldn't bring myself to publish it. So... imagine a picture of a bald 19 month old little boy grinning ear to ear on the "pot" here. I potty-trained my developmentally delayed daughter a few months ago using the ideas in "Toilet Training in Less Than a Day". She had just turned 3. LOVE it! I just bought the book! I can't wait to try it on my 21 month old! She's been ready to potty train for awhile I just havent known how to do it so ive been putting it off! LOVE this method...I tell everyone it's the only way to go. Talk about MUCH less frustration for everybody in the house! So I have that book, and I read it, but I wasn't totally committed. My little guy "got it" pretty quickly and even stayed dry at nights. But even still, after over a year, he has accidents. His pediatrician says it's cause he's "too busy." What do you think? Did I go about things wrong or is it just going to take a while?